In the city that never sleeps, there are a million places to get down on one knee and ask, "will you marry me?" From iconic attractions to quiet nooks in the middle of the hustle, there is a perfect proposal spot for every couple. In celebration of spring engagements, we are sharing our favorite places to get engaged in New York City. Central Park is known around the world, but there are countless romantic places to make your own inside its borders. Enjoy an afternoon picnic, a stroll at sunset or go all out with a horse-drawn carriage ride for your big moment. There are 843 acres, 26,000 trees, and almost 9,000 benches...but you only need to find one spot for your grand moment. This Central Park proposal story is definitely worth checking out-- for proposal inspiration and a sweet story! Iconic and memorable, the 86th floor of the Empire State Building lets you put a ring on it and then enjoy a gorgeous view together. Matt and Linda won The Perfect Proposal New York and shared their special moment at the Empire State Building. Read their story here. How romantic to make one of the busiest spots in New York City your own for a moment. Get down on one knee in the middle of a crowd, on a bus, next to the Naked Cowboy, on a rooftop bar or with a flash mob proposal like this one featured on How He Asked. In a ferry, on the bridge itself or at a park below, a Brooklyn Bridge proposal offers an unmatched backdrop of the city. This romantic Brooklyn Bridge proposal offers inspiration for some of the best spots to ask the question or just take photos afterward. 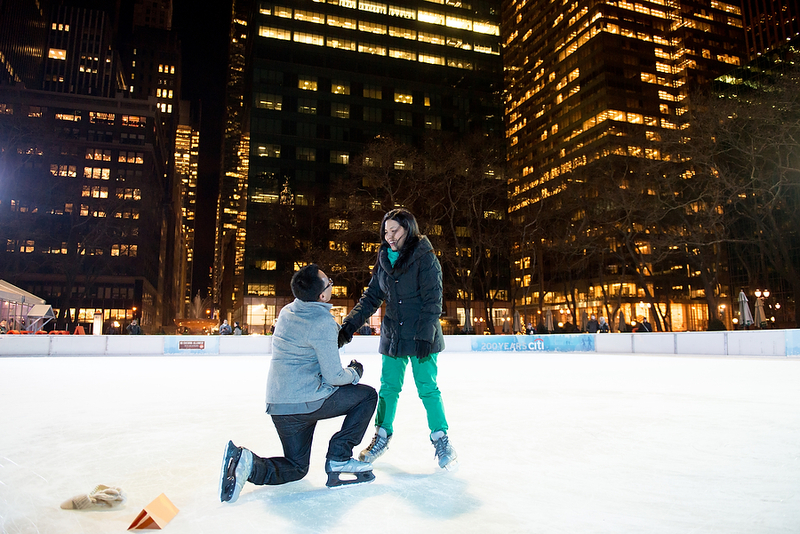 Take advantage of the gorgeous outdoor settings of beautiful Bryant Park for a romantic NYC proposal Take over the ice rink or break out a quilt on the greens for a perfect start to your engagement. Check out this Bryant Park flash mob proposal here.